Before I crawled into bed last night I discovered an envelope waiting for me on my pillow. Inside was a card that read, “Today I am reminded of all that is good in the world.” It was the perfect ending to our weekend away together to celebrate our 5 years of marriage. Five years have come and gone. Already. In the first year of marriage we crammed in a job change, adopting a chocolate lab, a house remodel, and a pregnancy. (We figured, why not put a new marriage to the test with some high stress?) We paddled our way to the other side to the land of a newborn and sleep deprivation and days upon days of feeling like you’re at the first day of a new job with no training manual. We tore out our kitchen in the middle of toddler mayhem and camped out in our own home. We’ve traveled on planes and trains and road tripped and camped. We’ve reached mountaintops and breakthroughs in learning how to love and communicate with one another and we’ve waded through seasons of being misunderstood and going through the motions, too tired at the end of a long day to figure things out. We’ve experienced the hopeful anticipation of another child and the unexpected loss three times. We’ve looked up searching for answers. We’ve held hands. We’ve celebrated and relished in the miracle of our little boy. We’ve laughed. We’ve teased. We’ve danced in the living room. It’s good to be reminded of all that is good in the world. It’s important to look back, to see how God was faithful. Our wedding day is a testament to the faithfulness of God. God heard our prayers, our longings, and God answered that prayer in the relationship we have today. It’s good to remember, even on the mundane days, on the days I don’t feel very loving, that my husband is the provision of God. One of God’s greatest gifts for me, planned out long ago. So, today, I choose to look at him and be reminded of all that is good in the world. A reflection of God’s goodness, grace, and mercy. “I will look back and see that you are faithful. I’ll never forget those words my Mom spoke to me on that crisp afternoon in the Spring of my tenth year of life. I was standing outside of Ordway Elementary School with the rest of my fifth grade classmates as our teacher gave a demonstration. I was oblivious to my Mom being escorted by a school administrator as she quickly approached me. I was, of course, shocked to see my Mom. But more than any emotion I may have felt at the time, all I remember is her saying to me, “We’re going on an adventure,” and then being quickly pulled away from my classmates as we briskly walked to her car. “Are we going to Disneyland,” I thought? What kind of adventure were we going on? I got giddy at the thought of it. As soon as I opened the car door, I saw the solemn look on my Dad’s face. And then his words felt like a kick to the stomach as he said, “We had a house fire.” No fanfare. Just the few words needed to get straight to the point. 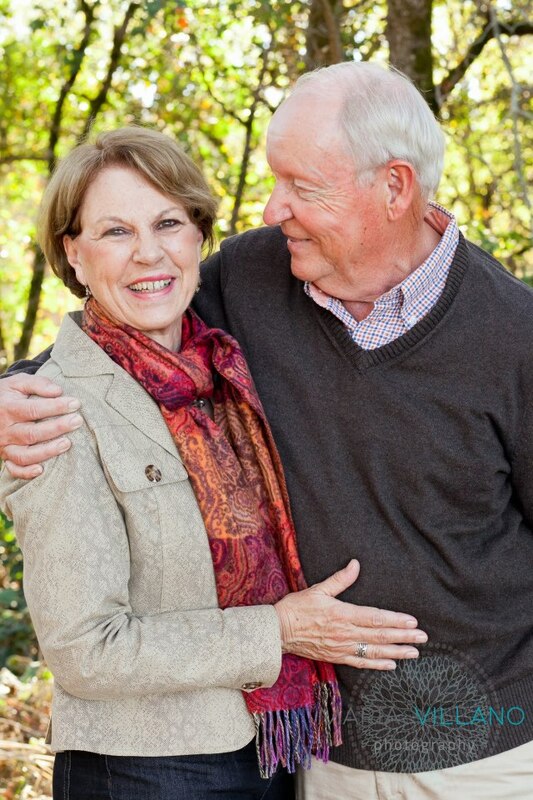 This past weekend we celebrated the 50th wedding anniversary of my in-laws, Gary and Johanna. Their story is very different from the expected love affair of our day. There was no quest to find the perfect soul mate, there were hardly any dates between the two of them, and there was no elaborate proposal. The most important thing they knew was that both came from solid, Christian homes where faith in God was the foundation. After they got married, Gary moved back to the States as he had joined the service, while Johanna stayed home in Holland. They were separated for the first year of their marriage! After that year apart, Johanna left everything that was familiar to her – her home, family, friends, language, culture – and joined Gary in Biloxi, Mississippi. Talk about culture shock. Now, 50 years later, they have 3 children and 6 grandchildren, and have made a loving home founded on God’s amazing love and grace. My parents always told me that whenever I got married, I wouldn’t just be marrying some guy… I would also be marrying his family. I am honored and blessed and proud to have married into a family that loves and enjoys one another, is committed to one another, and gives all the praise back to God for holding each family and marriage together. Ever since I met Carl, he has lamented about how his name has been dragged around in the mud by less than appealing characters in the movies, TV, and commercials. I didn’t really believe him, but then he had his defense all lined up. “How about the movie Fargo, where Steve Buscemi plays kidnapper Carl Showalter? Or how about Billy Bob Thornton who plays the troubled Karl Childers in Sling Blade?” And, then, there’s the crotchety old man Carl Fredericksen from the movie Up. Now that I’m aware of his name abuse, I’ve noticed that 90% of the time when there is a man’s name mentioned in a commercial, the man’s name is Carl. But I say in response, how about Carl Lewis? You know, one of the fastest men on the planet? Well.. this past weekend, Carl got to meet Carl. 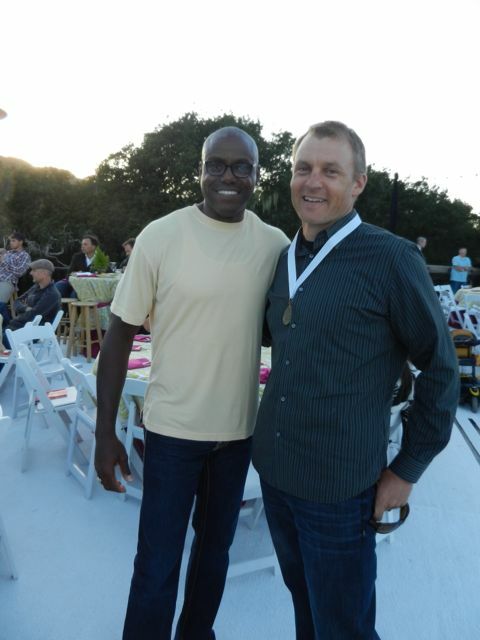 The fastest man (Carl Lewis) got to meet the fastest cycling man on Saturday (my Carl) who was the first to cross the finish line for the 100 mile fund-raising ride for the Best Buddies Challenge from Carmel to Hearst Castle. So, I think I win the argument that it’s not so bad to be named Carl after all. These shoes make me smile every time I see them. A dear friend at one of my baby showers gave them to me. 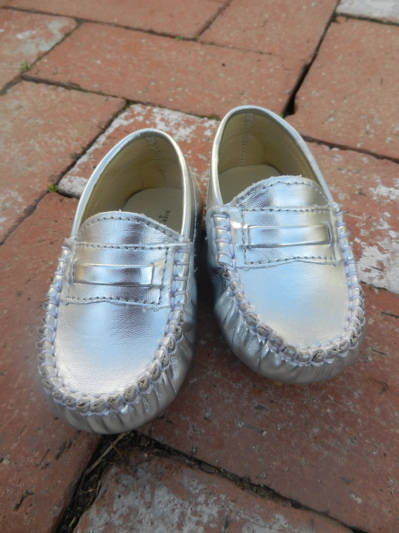 Knowing my love of Michael Jackson’s Thriller days, she knew I’d crack up over the shiny metallic silver shoes, envisioning them on my baby-to-be doing the moonwalk on our hardwood floors. This friend knows me well. We’ve laughed a lot together over the years, and possibly cried more together in public than any other friend I know. It seems like every time we would go out to breakfast together, one of us would run out of Kleenex as we shared the hard things of life. When I look at these shoes I smile and I’m thankful, because I realize how good it is to be known. I also get a little teary as I’m in a season of life where so many things are new – new town, new community, and new role as a mom. I used to love the adventure of moving some place new and exploring my new surroundings and meeting new people. Yes, there were tears sometimes in the beginning, but after I got over that hurdle, I’d dive right in. Going to six different elementary schools in three different states will teach you how to be adaptable. But making friends as an adult – no, as a wife and as a mom of a new little guy – is exponentially more challenging. Gone are the dorm-room and summer staff Young Life camp days when you have a new bestie after a few days of bonding. I think I took it for granted as a singleton when I was free to join every evening event or volunteer activity where relationships can be formed so quickly. At this stage of my life, I feel like I am dating everyone, and it is exhausting. It amazes me how much more effort it takes to get things on the calendar, since the calendar is no longer my own. And when you only see someone once or twice a month, in the midst of babies crying and toddlers running under foot, not only does it take significant discipline to stay focused on a conversation, but it adds to the slowness of moving towards any sort of depth in a friendship. I often sigh a deep internal sigh when people say, “When I first met you, I thought you were very reserved and quiet.” Oh, new friend, you have no idea. Friends that know me understand that I’d rather have a karaoke microphone in my hand on a Friday night than a glass of fine wine. There is silliness in me that needs to be expressed on a daily basis, or I will burst. It truly is a good thing that I have a little guy who likes to be entertained. We all long to be known. It’s how God designed us. I just think that feeling is much more acute during this season. At times like these, it’s important for me to remember how God has provided amazing friendships in the past and IS forming new relationships in my life as I write this. Each time that I have moved, I have been given the gift of friendships. These friends are like precious stones that have added to the beautiful path on my journey. Just the other day, one of my new friends made the comment that my middle name should be “fun.” What a compliment, and what joy to know that I am in the process of being known. 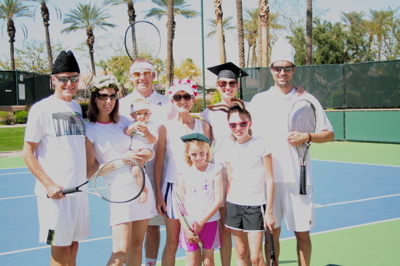 After a brief hiatus last year due to a ball boy tennis academy, the 3rd Annual Baer Tennis Whites Classic has resumed. 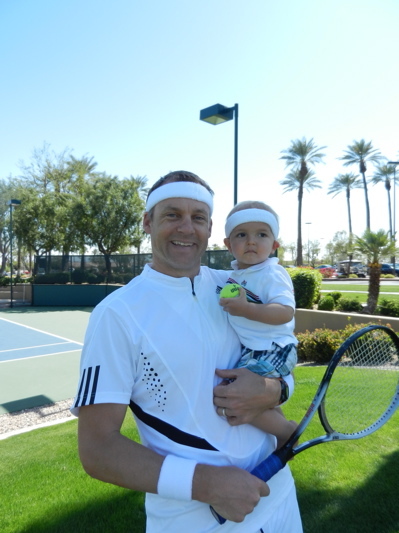 The theme this year would make John McEnroe proud… headbands (or other crazy head-gear). 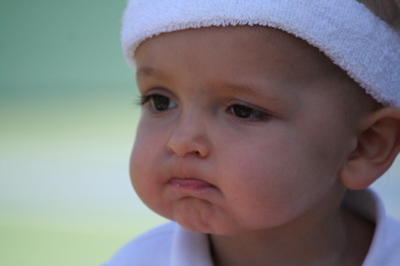 Our fantastic ball boy… that is, when he didn’t have a graham cracker in each hand. Thanks buddy. It was a ferocious death with all the powers of hell amassed against the one good and loving person who ever lived. But without that struggle on Friday, withought the pain of his loving us to the death, there is nothing to celebrate today. It’s simply a warm blanket. No struggle. Nothing happened. Nothing has changed. If there is no death, then God’s got nothing to do on Easter. But if there is a death, then Easter morning is a ferocious moment when life triumphs over death, and what God did on Easter for Jesus and for us is the most radical and important truth that any of us can know or believe. Pictures taken at a Benedictine Monastery in Taos, New Mexico.